We are happy to venture into Canada to give you our first non-U.S. sportsbook review featuring Bodog. Our analysts have spent countless hours researching, using, and listening to users’ likes and complaints for online sportsbooks all over the world. With this knowledge, we are attempting to offer you an unbiased account of our thoughts on each of these sportsbooks. As you read through this review, you will find that we have a lot of good things to say about Bodog. We hope you enjoy! Depositing money into Bodog is very easy and there are a ton of options to get your money up on the site and ready to gamble. The most common, and certainly the easiest of methods is to use your Mastercard or Visa card to fund your account. Note that for security sake, that you must verify your credit card later by sending in a photocopy of your ID and the card in order to protect you and Bodog from fraud. Another easy method is to use a direct bank transfer (DBT). This will tie your bank to Bodog and is another easy way to get your funds in and out of the sportsbook. Another great benefit for Bodog is that the minimum deposit is only C$20 which is very low compared to what is required at other sportsbooks. For more information on deposits, the Bodog site provides some excellent information: Bodog Finanical Help Page. Simple and clean, the Bodog betting interface makes betting very easy even for new users. The software that they use is top notch and it’s pretty easy to tell how simple the system is from the picture of the interface posted above. 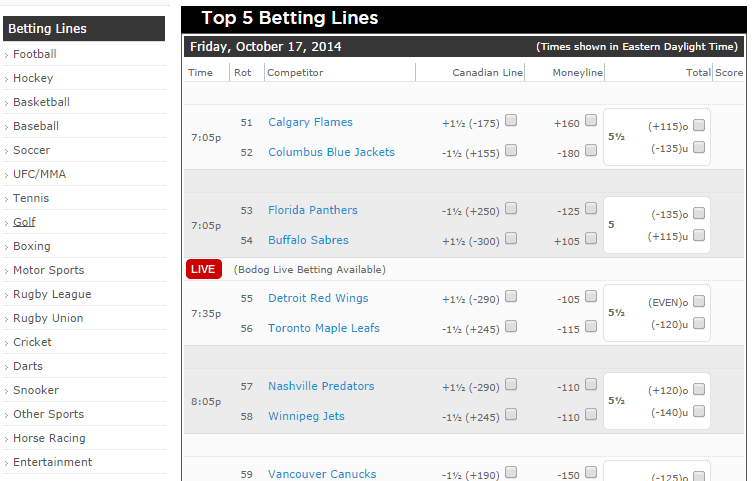 The betting interface for Bodog defaults to the top 5 betting lines of the day. 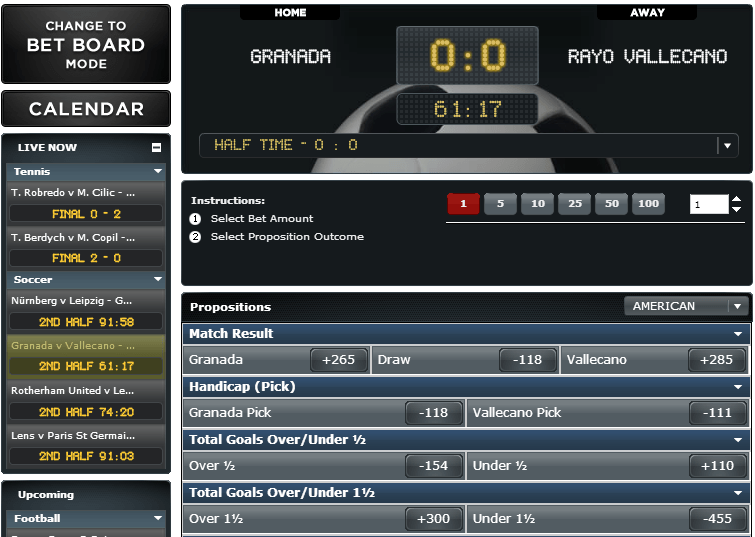 The menu on the left side of the page lists the sports or exotic categories that are available to bet. To check those, you simply need to click on the sport and select the current lines from the drop down menu. Placing a bet is equally as easy. You can see all of the spreads, money lines and total score bets available for each contest. To place a bet, click on the bet that you’d like to make and the game will pop up in your bet slip. From there, you can select the amount that you want to wager and if you would like to parlay or tease the bet. Once all of this is selected then you can review and confirm the bets. All said and done, it is very easy to make and place bets. Getting right to the point, there is no doubt that the biggest downfall at Bodog is that they are very slow to put their lines out. This is completely by design. The folks over at Bodog are trying to cater to a more recreational crowd which is great if you want a sportsbook with great bonuses and promotions (if you read on then you will find that section), but bad if you are a sharp bettor and want to get in on line openings. For the Layman, sharp bettors like to jump on early lines to get the best odds when they have a feeling that the line will move (like it sometimes does). Bodog takes this completely out of the equation by opening their lines later once the line has already moved significantly. For most people, this isn’t an issue, but if you are a professional gambler then you don’t want to use <Bodog. On the other hand, there is a lot to like in that the minimum bet is only one dollar. The maximum bet varies by the type of bet you are making, but it is generally anywhere from C$500 to C$2,000. This is well within reasonable means for any reasonable recreational bettor so I’m not going to knock Bodog for their maximum limits. If you are like me and think that you can find an edge live betting then finding a book with a great live betting platform is important. As one can see above, Bodog’s live betting platform is pretty cool. Starting on the left side of the screen, you can find all of the games or matches that are currently live and directly under that are the games that are upcoming. On the main screen, you have the game that is selected with live updates on top, then the selection of bets on the bottom. The instructions are simple and also found right on the screen. First, you select the amount that you want to wager and then you select your proposition. The one thing that is a little frustrating across a variety of live platforms is that the propositions come and go very quickly as there is a lot of changes in the games. Sometimes it gets a little bit frustrating trying to put in a bet only to find out that the proposition has closed or the line moved. 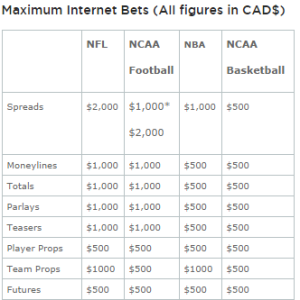 All in all, Bodog has a very solid system and is probably in the top third of all live betting systems out there. Bodog offers a few different ways to get paid out when you are a winner. Most importantly, the payouts at this sportsbook are no-hassle, easy and quick! Fees vary based on where you are located, but in most instances, you are able to get one free payout per month. The first method is Direct Bank Transfer. If you already deposited money using your bank then it is just as easy to get the money out this way as well. The second method is to get a check by courier. This method takes a little bit longer and the checks are capped at a maximum of C$3,000. The third method is Visa Card. You can use this is you deposited money with the Visa card and your card is eligible for deposit. Bodog is simply one of the best in the industry when it comes to bonuses and promotions. To start, with a first time deposit, you will get a 100% free bet bonus up to C$200. Consistently, throughout the year, Bodog will offer different promotions that lead to risk free bets or cash to go in your account. As I write this, there is a 10% rebate on all parlays over 5 games for NFL games and a bunch of different casino rebates. You will notice that Bodog designs their promotions to cross products. So a sports promotion might earn you casino chips or vice-versa. This is something to keep in mind if poker or casino games interest you. Pro: More promotions then almost any other sportsbook out there. Pro: Customer service gets very high marks and you get reliable/quick payments. Pro: Casino, horse betting, and poker section of Bodog is excellent. Pro: Perfect for the recreational bettor. Con: The lines in the sportsbook come out very late. Con: The odds aren’t as favorable as you can find at other sportsbooks. 9/16/15: Free bet bonus increased from C$100 to C$200. Bodog grades as an incredibly reputable and highly recommended sportsbook. There are hundreds of sportsbooks out there that cater to the Canadian crowd and Bodog absolutely falls into the category as one of the best. As I mentioned earlier, though I would tell the big money guys to stay away. If you are a recreational bettor, then I would say that Bodog is absolutely the sportsbook for you.